Wondering what to eat in Delhi's Shahpur Jat neighborhood? This cool urban village and designer hub attracts a lot of health-conscious hipsters. Hence, wholesome vegetarian food is popular, along with gourmet teas and coffee. In addition, look out for some groundbreaking restaurants serving cuisines that you might not be familiar with! It's not often that you get the opportunity to try authentic regional cuisine from Bihar in India, let alone in such a funky environment as the Potbelly Rooftop Cafe. Therefore, it's no wonder that this cafe is a popular hot spot for foodies in Delhi. Its owner was a fashion designer before deciding to diversify into the restaurant business. She opened the cafe in 2011 using her mother's recipes, which have been handed down over generations—so you know the dishes will be homely and delicious. 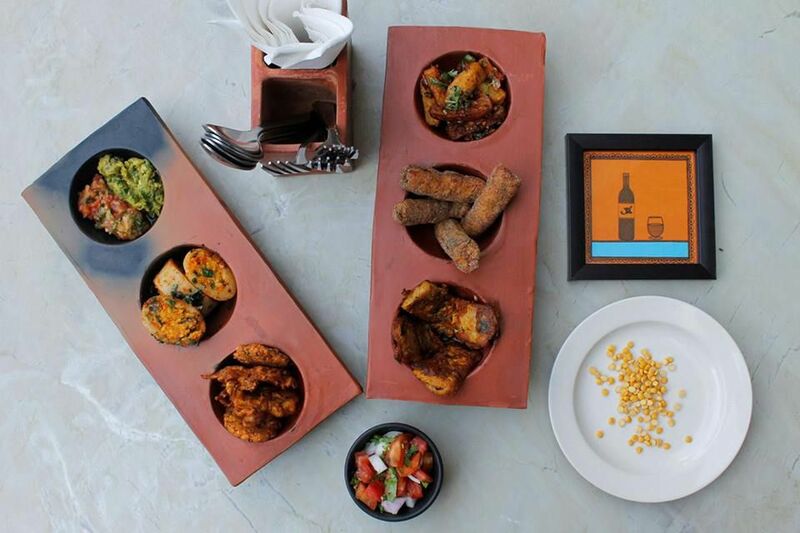 Order the Baggia Basket (pockets of rice flour stuffed with spiced channa daal and served with chutney), Litti Chokha (a trademark Bihari dish of whole wheat balls stuffed with spiced flour), Fish Chokha (spicy fish salad served on crispy poori bread with chutneys), mustard fish curry or prawn curry. Do note, there's no elevator and you'll have to climb four flights of stairs to reach the roof. Also in the same building as The South Delhi Kitchen but on a lower floor, this cozy restaurant is another surprise. It serves Modern Australian cuisine and was named after a popular Australian children's book series! Expect an eclectic menu, with European and Asian dishes (like roast garlic lamb chops, butter garlic prawns, Caesar salad and Tiramisu), that's been influenced by immigrants to the country. The restaurant's owner is also the chef, and she spent a decade in Australia working closely with celebrity chef Matt Preston. One of the restaurant's walls has a huge bookshelf that's been turned into an honesty library. Take a book and return it, or swap it with one of your own. Choose from indoor or outdoor seating, tables or sofas, and get comfortable. Interested in healthy food and living? You'll love Greenr Cafe! Its menu was inspired by the owner's time spent in California and features organic, vegan, gluten-free, and high protein plant-based options. Think sweet potato fries, lentil burgers, tofu wraps, and vegetable sausage pizza. The cafe's concept is created around sustainability and community. There's a co-working space, free wireless Internet, and yoga classes. Organic and vegan products are also available for purchase. Try the jackfruit carnitas, French lentil burger, the Bangkok bowl or the Beirut Bowl. Wash it down a cold-pressed juice, smoothie, or artisan coffee. Take break from shopping for quirky home decor at The Wishing Chair and recharge at their whimsical Mad Teapot cafe, situated in-store. Both the store and the cafe have been inspired by Enid Blyton's children's books, and this has extended to the names of the dishes on the menu. The cafe's collection of tea pots is also fitting. And, of course, there's an assortment of boutique teas to go with it from Tea Trunk, Jugmug Thela, and Anandini Himalaya Tea (they also have a tea room in Shahpur Jat). Pair them with a freshly baked cake from the display, or a more substantial vegetarian salad, sandwich, pasta or flatbread. Coffee aficionado are catered for as well.